In a society where we are experiencing a constant evolution in technology, it is important that all other areas of study continue to evolve as well. The very meaning of “communication” expresses the interchange of thoughts, opinions, or information by speech, writing, or signs. The study of communication today can change the way we interact tomorrow. You may choose to study different techniques such as journalism or public relations. If that route isn’t for you, then you may choose to learn the different media for delivering these messages. These might include radio, television, production, film, or even print. 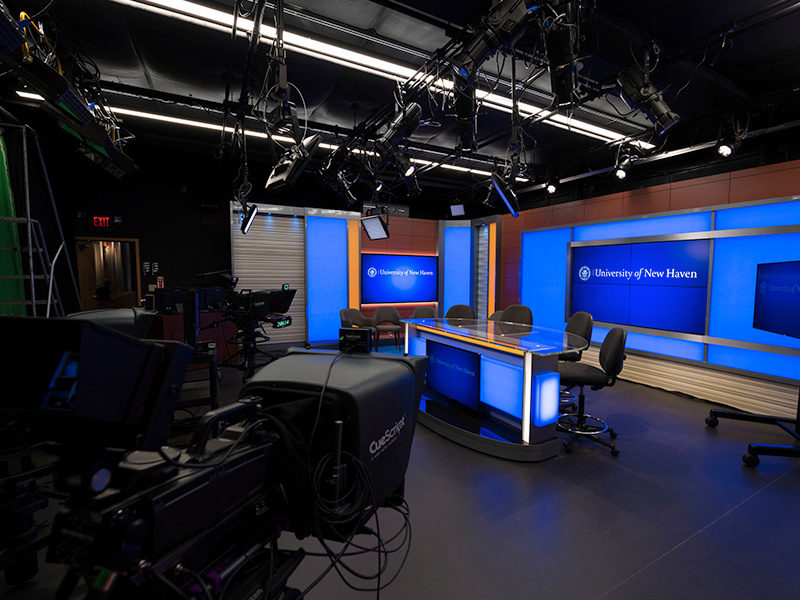 Our brand new Broadcast Set is part of a newly renovated Communication Center, a bustling hub of media activity where our students get to experience the communication industry in action— both in front of the camera and behind the scenes. Work on a cutting-edge set with industry-level lighting and the latest in digital equipment. Get to know what behind-the-scenes production is like. In our expanded television control room, you’ll become one of the production crew that makes the show happen. Pull everything together in editing suites packed with the latest technology. 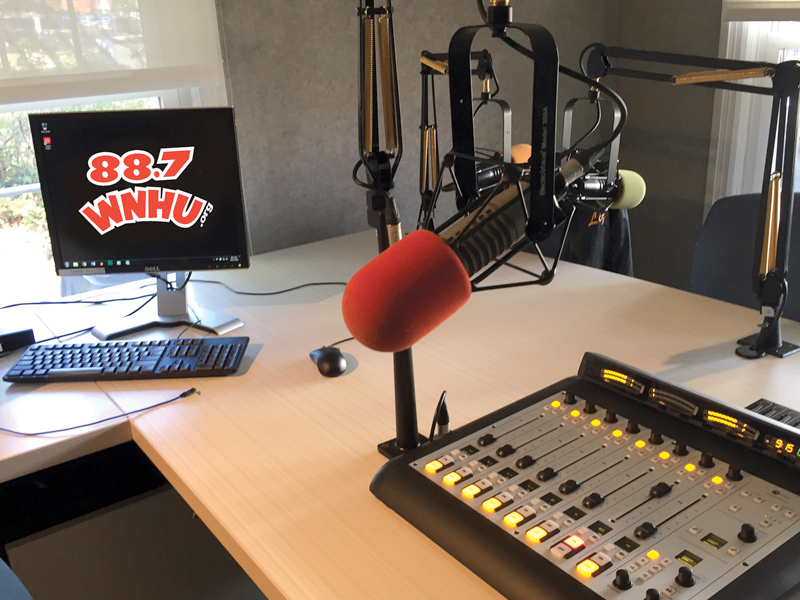 WNHU is the FCC-licensed noncommercial educational radio station of the University of New Haven, broadcasting at 88.7 FM. The Station operates as a lab for student learning, and as a source of culturally diverse programming for the communities we serve. Our state of the art facilities are located in the Lois Evalyn Bergami Broadcast Media Center at 46 Ruden Street, and include production space for live and recorded programming, a server room, staff offices and a student lounge. WNHU is managed by a student leadership team. These positions provide valuable opportunities for experiential education, as this leadership team is paid by the University, and handles the majority of our day to day operations. Located in Maxcy Hall at the heart of campus, the Laurel Vlock Center for Convergent Media is a key resource for Communication students. The Center allows students to combine the technologies that integrate radio, television, newspapers, and the Internet. Students also learn to write, plan production, edit video, and post their mixed media to the Internet. With the training and education of this newest technology, our students will be well-prepared as professionals in communication offices and newsrooms. The Vlock Center uses software such as Avid® Media Composer, EP Movie Magic Scheduling 6, Adobe® Creative Suite® 6, Adobe® After Effects, Audacity®, and Apple® Final Cut Pro®, which is used for video editing and is the industry standard. The University of New Haven hosts the Final Cut Pro network, which enables students to edit their work on any of the 32 equipped computers in the Communication Department. 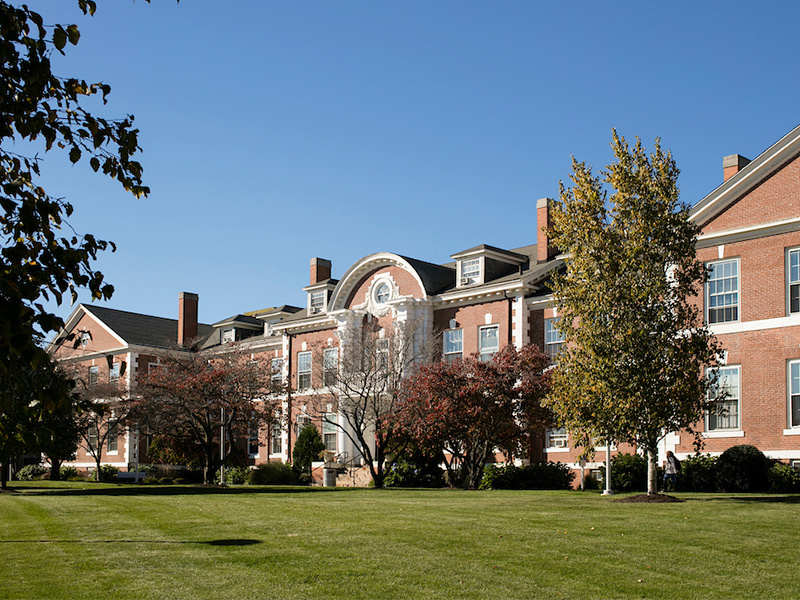 Furthermore, the University of New Haven is the only Apple-certified training facility in the State of Connecticut.